What a home! Very popular Manzanita model explodes with a spacious and open floor plan! Plantation shutters frame ALL the windows. Upgraded lighting/fans throughout. Large breakfast room windows let in loads of natural light. Walkout to a big patio complete with custom electric shades. Den/office w/double 8ft doors. Split master bedroom features large bay window wall and beautiful master bath. Gorgeous tile floors t/o and carefree laminate in bedrooms. Stunning chef's kitchen with granite counters, 36'' cabinets, all appliances. Super island makes a great gathering place for family and friends. Laundry room has sink and lots of storage cabinets. Enjoy the park-like setting across the street! Your home hunting journey ends here while the good life begins at this wonderful Trilogy community. Fully fenced southern rear yard with privacy galore. 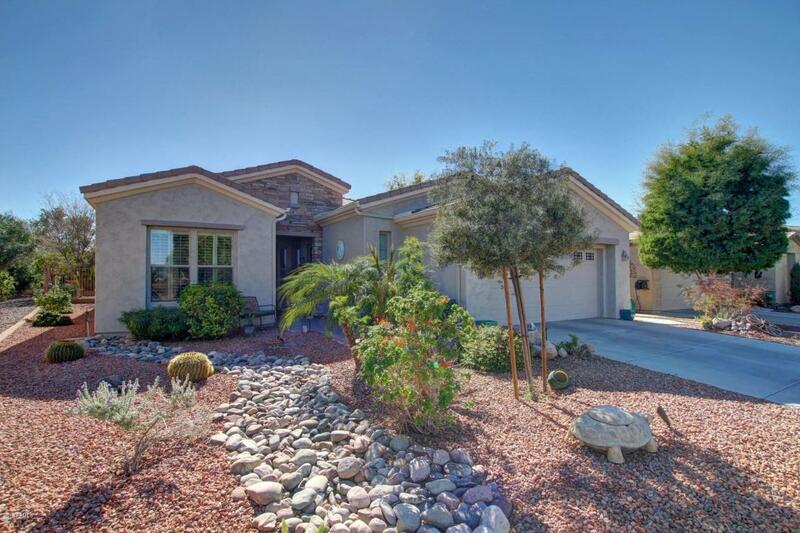 Peaceful & serene backyard boasts covered and pavered patio, colorful flora, desert landscape. Very private. Electric shades to keep the patio cool and all nestled on a view lot across the street from a park. Fully fenced southern rear yard with privacy galore. Enjoy golf, billiards, crafting, beautiful community pool and tons of activities at the very amazing adult community of Trilogy! So much to do and yet very close to shopping, restaurants, healthcare and the 202! Reasonable HOA fees, low taxes, lots of fun!